Last night, the Sons of Norway Lodge I belong to held it's annual display of traditional Norwegian Folk Arts. The embroidered piece here was done by someone's grandmother based on a painting she'd seen. It's just gorgeous! 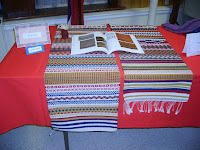 Melanie showed her traditional Nordic weaving. It's absolutely gorgeous. 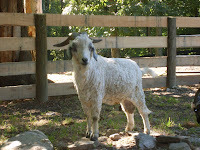 She uses a special wool from Norway. She only has to complete the lightning weave to get her certificate! Wahoo! 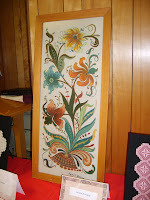 Hardanger embroidery and needlework are a well known traditional Norwegian art. All the examples were even lovelier in person than in my photos. 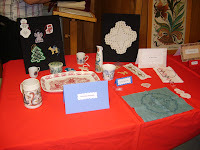 The display was accented by several lovely examples of Norwegian porcelain. 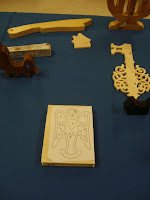 Several of the Hardanger pieces on display were Emile's. 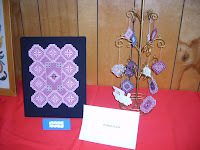 Her Hardanger embroidery took first place at the convention in Norfolk this past June - congratulations Emile! 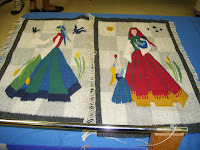 This shows a close-up of the first two stages - as a young woman and as a mother. 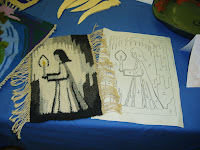 This shows the drawing that the tapestry of the girl with the candle was designed after. 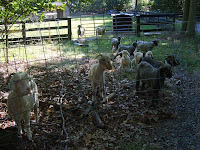 The transformation from "pen" to "wool" is fascinating! Again, this was one of Solveig's creations. 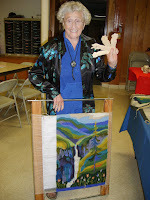 Solveig also spends here time carving, painting, and bookbinding - what a busy woman! 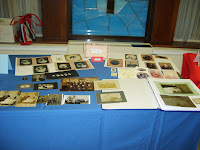 One of the displays was of photo restoration - some of the photos are more than 100 years old! Several family pictures form Norway have been restored - if you look closely, you can see the originals and the final restorations. The quality of the resulting restorations was fabulous! 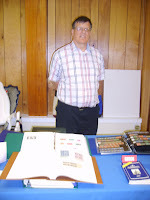 A couple of the folks had fabulous stamp collections of Norwegian Stamps. 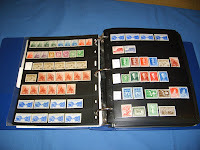 Both Pat D. and Rick N. had impressive albums of stamps. Pat's husband, Bill, has recently started wood carving. 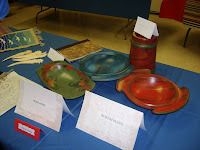 Several of his finished items as well as a number of "works in progress" are shown here. 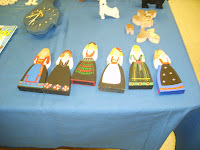 The carved girls (above right) represent the various Bunads of Norway. Bill did the carving, and Pat did the painting. How perfect that their talents complement each other so well! The clock in the above photos is being donated to the lodge...what a great idea! 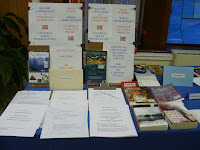 There was also a literary display. Christine was awarded a medal tonight for her accomplishments in Norwegian literature. Thankfully, she was permitted to read them in English and write her essays in English as well. She's planning a reading group with the lodge. Congratulations to Christine for her medal! 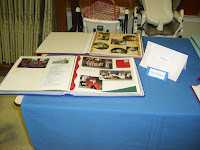 Ellen had a display of the lovely scrapbooks she keeps which chronicle various Norwegian events. 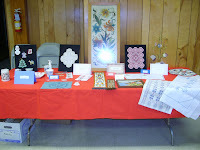 She also has a scrap booking group that meets at the lodge. 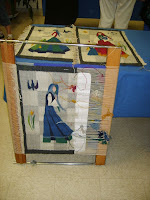 I demonstrated spinning with both the spinning wheel as well as with the drop spindle. 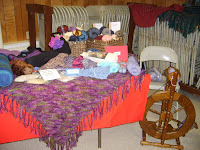 I had several of my hand spun yarns in baskets on the table as well. 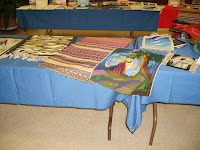 I also displayed a number of my knitted and felted items - including shawls and numerous socks. 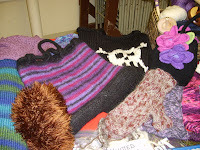 Coincidentally, I still hadn't felted the "Skully Bag" and included it in my display at the last minute. 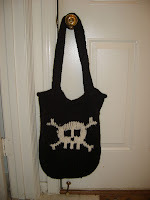 It turns out that Sept. 19th was "Talk Like a Pirate Day" - so I had the perfect knitted item on display! 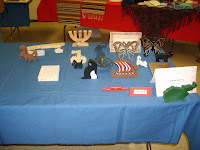 While both knitting and spinning are traditional Norwegian arts, none of the finished objects I displayed were "traditional Norwegian" items. Next year, I plan to have completed either the Norwegian Socks (Norwegian Lusekofte Socks) or the Norwegian Mittens from patterns by Beth Brown-Reinsel. 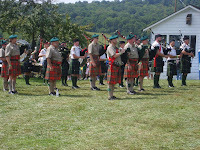 Sunday was unbearably hot, but we went to the Scottish games anyway. We lasted less than 3 hours and did not get to see the Caber Tossing competitions. However, we did manage to hear my favorite Celtic band, Rathkeltair. I love their music! We caught the 11 am show....while the temperature was still in the 80's. It quickly heated up well into the 90's with very high humidity. 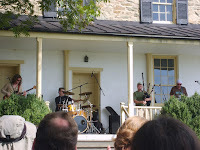 This year, instead of a separate stage, they used the porch of the house at Sky Meadows State Park. It was a bit harder to see them, but the lack of stage nearly doubled the seating capacity. Neil (the piper) is absolutely amazing! 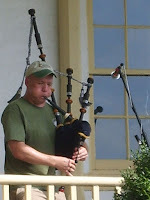 He plays so many instruments - including both the Scottish and Irish versions of the pipes. 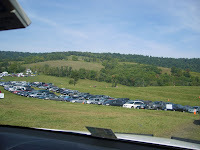 Sky Meadows State Park is the perfect venue for this festival as you're surrounded by mountains and gentle rolling hills...the "Highlands"? 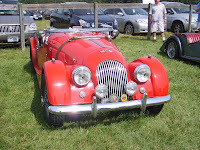 This year, just as last year, they had numerous bag pipe bands and a large display of British cars - from Morgans to Austins to Jags. I was fascinated by the Morgans. I even found that they're "fiber related" - the hood straps are lined with lambs wool! 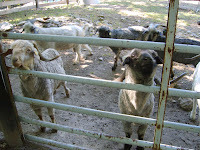 Proof once again that wool isn't "just" for knitting! LOL! I also discovered that they make camouflage kilts as well! 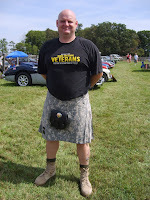 One of our courageous veterans kindly posed for me so I could get a shot of a military style kilt. How cool is that! It was just too hot to knit while watching Rathkeltair, so the only knitting I got done was in the car to and from the festival. I did finish the back of a sweater jacket and started on the left front. I really like the style. 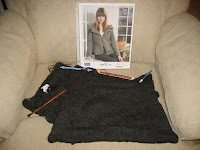 It has crocheted edging on the sleeves and the bottom of the sweater. I'm making it in Ulteppegarn rather than Eco-Ull as I wanted a lighter weight sweater. It's knit on size 9's, so it knits up quickly. I received an awesome package (full of my favorite color!) from my swap partner, "Knittensilly" for the Ravelry "Monthly Adventures" swap. Everything is just perfect! 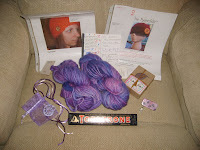 The package even contained a couple of patterns and a gorgeous button to coordinate with the yarn. I'll definitely have a fabulous hat for this winter! It's going to be a very awesome hat! Now....I just need to decide which pattern to use.....hmmmmmm. Nestled amongst all the other goodies was a fabulous pin! 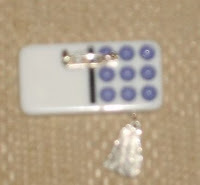 It's a really unique pin made from a domino! I just love it! Thanks so much for the wonderful package! Knitting Progress...Yes, there is some! Believe it or not, I've even made some knitting progress - in spite of all the time spent dyeing, visiting fiber farms, yarn tasting, spinning, etc. 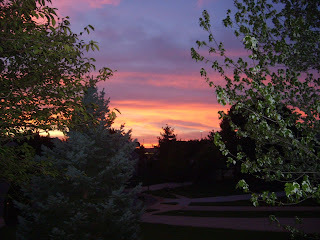 All these activities is also why I got so woefully behind on my blog! 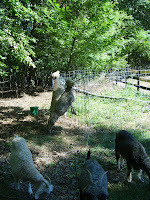 It's either knit/spin/play-with-fiber or post on my blog. Obviously, since I've gone so long without a post because I chose to knit/spin/play-with-fiber! I also completed the knitting portion of a bag I started on 8/30. It's a felted bag using some Caron "Felt-It" yarn that I'd picked up for $1.50 per skein at "Big Lots" in Illinois this past summer. 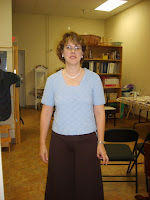 I finished knitting it on Saturday (9/6) and sewed it together in preparation for felting last evening. 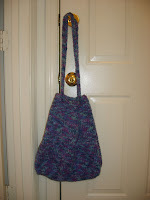 I used 6 skeins to make the bag - that's an unbelievable materials cost of $9.00! 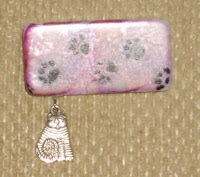 If it felts nicely and I'm pleased with the final dimensions, I'll post the instructions on how to make it. 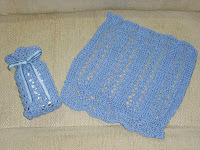 I completed this face cloth and soap sack on Saturday - only 1 week after I started them! 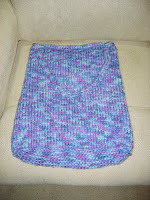 I used the Fiber Trends "Bathing Beauties" pattern and Glaciar cotton yarn from Aslan Trends. I think I need to make these for Christmas gifts - they're pretty, practical, and for a handcrafted project knit up quite fast! On Tuesday, I got together with some other spinners and spun about half a bobbin of the white and red mohair I bought on Labor Day. I really like how it's turning out. Sorry...no photos of that yet. 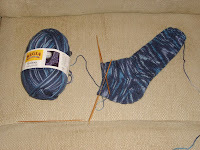 I even managed to get in some "Metro knitting" and am well on my way to completing the foot of my Galaxy sock. This is the first sock, so I still have quite a ways to go before I have a complete pair...but it's a start! 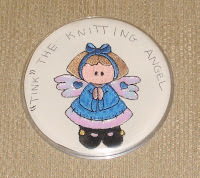 Finally, I thought I'd share a picture of the pin I made for my swap partner in one of the Ravelry swaps - it's "Tink the Knitting Angel". She's supposed to "watch over" my pal and keep away any bad knitting vibes...and hopefully reduce the need for "tinking" or "frogging"! 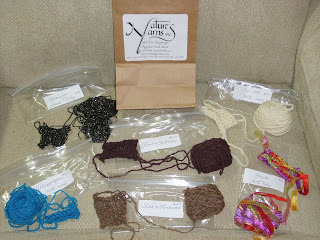 This past Sunday was another "Yarn Tasting" at Nature's Yarns. It's a fabulous way to "try out" a yarn without committing to the purchase of an entire ball. There are snacks as well - always a welcome addition! Getting a discount on the featured yarns is an added bonus! It's a lot of fun chatting with the other "fiber enthusiasts" and comparing notes on what we think about the various yarns while we "test drive" the fibers. All of my "swatches" were small....I think I spent too much time chatting! I can't wait until next month...the featured yarn will be "Tilli Tomas"! Oh...just before the "yarn tasting", I took a quick photo of Amy trying on the sweater that Kathleen made as a gift for her birthday. The ends haven't been tucked in yet as this was the "final fitting" and if adjustments were needed, the yarn was ready and waiting. Kathleen did a fabulous job knitting and constucting this sweater....and Amy looks fabulous wearing it. It's a perfect fit! 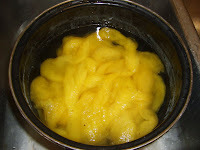 I finally managed to dye some roving with the goldenrod dye I made at the end of August. 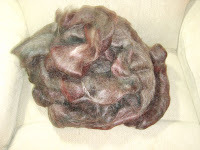 I dyed 40 grams of Rambouillet roving using primarily the Hopi instructions. 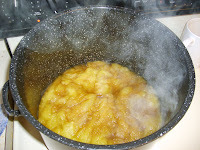 I boiled the wool for about 2 hrs. in the pot using a mordant of alum. I "measured" two handfuls...just as the book instructed. 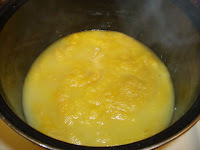 This produced a canary yellow color. 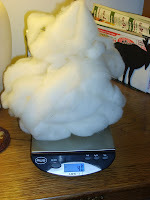 Then, I shaved some ivory soap into boiling water and added the roving to that pot for a few minutes. This produced a more golden yellow. 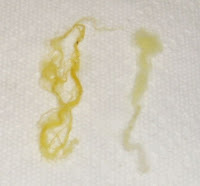 Here, you can see a small piece of roving without the ivory (the brighter yellow) and the result after submerging in Ivory (the deeper golden color). Unfortunately, I didn't think to take a small sample of the roving BEFORE I submerged it in the soapy water - that's why there's such a SMALL piece for comparison. The final color "resting" in it's clear rinse water. 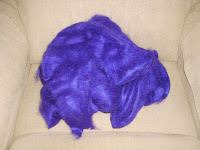 My next dyeing experiment (when I find the time) will be "Dyeing with Walnuts". 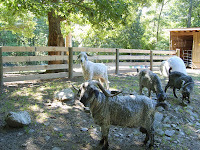 Labor Day morning was spent checking out Colleen's fabulous goats - the source of some exquisite and very soft mohair! I love the sign at the entrance to her farm - it's hand-painted and it's even purple! 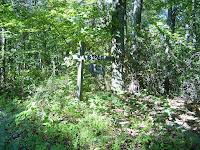 Giant Cricket Farm is a wonderful "hide-away" from the hustle and bustle of the DC area. 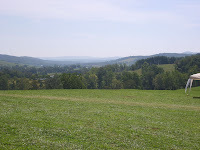 The farm and the house are surrounded by a lovely grove of trees...and the ride out to the farm was very relaxing. I took the grand tour - checking out the "girls" and the "boys". 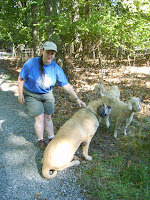 Colleen with Joy and the goats (left).....and a couple of the "girls" stretching up to partake of low hanging branches (right). There are very few trees with any leaves below shoulder height as the goats and the deer dine frequently on the low branches. It's a good thing there's plenty of trees for "everyone"! 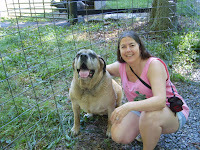 I managed to work in some cuddle time with her adorable Mastiff, Joy. She's such a sweetheart! She loves to herd the goats...it's real cute to watch. She's definitely a "gentle giant". I even got a tour of her garden as well...and was the beneficiary of some produce: hot peppers(salsa here I come! ), a purple Heirloom tomato that I used in a sliced tomato and fresh mozzarella salad and a large red tomato that I used for BLTs! Mmmmm! 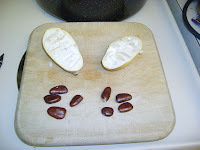 The most intriguing "produce" was the fruit of the Pawpaw tree. It tastes a little bit like banana. 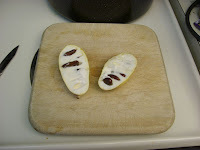 The skin is yellow when ripe and green when not ripe - just like a banana. 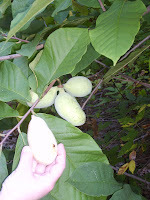 If you want to find out more about the Pawpaw, there's a brief history about it here. I think this particular fruit was just barely ripe. I could taste the "hint of banana" and found it to be a somewhat interesting fruit. DH was totally unimpressed and gave a big thumbs down. I thought the seeds (which are huge) were really fascinating. They prevent you from slicing the fruit lengthwise! 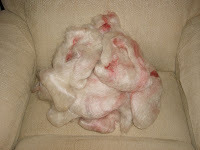 Colleen had just received her latest shipment of mohair back from the processors. Of course I indulged! Yeah, yeah....I know....I'm on a yarn and fiber diet. 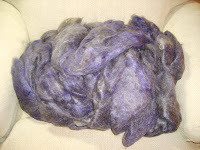 But hey, this is a "once in a lifetime" opportunity to purchase some custom dyed mohair in delicious color ways! (White with red streaks, "Bite Your Eyes Out Purple" - although my camera only picked up the blue color....it's truly a bright purple, Mahogany with natural and dyed colors, and some luscious purple mixed with natural colors.